Long-time readers of the Newsletter may remember that several times over the last five years or so, I have claimed that I was on the threshold of an MGA V8 project. Due to a combination of increased hours required at my job, a home relocation, assisting my father in building and moving into a new home (400 feet behind mine) and other factors the MGA shell and chassis have been sitting untouched and forlorn. However, circumstances have finally combined to allow the project's initiation. First on the agenda will be building the MGA's engine, as it will temporarily replace the worn out Olds 215 in my '74 MGB. After a season's tuning and break in, the new engine will be pulled and stored until the "A" is ready. I had originally planned a stock displacement Olds 215 with longer connecting rods, i.e. Buick 300. There are several advantages to a long-rod engine. I had collected most of the components for this engine when fate intervened in the form of a phone call from Dan LaGrou at D&D Fabrications. 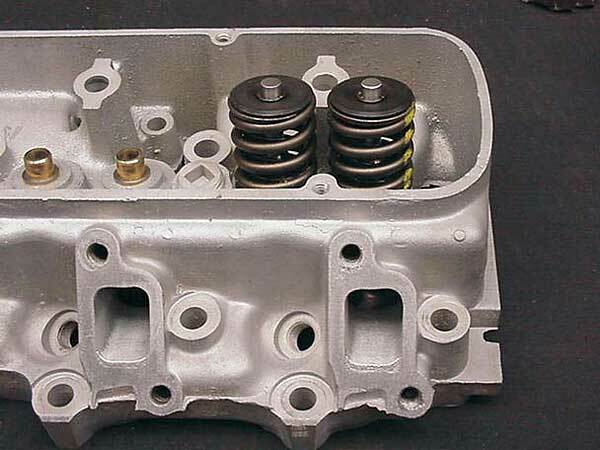 Dan had purchased an Olds stroker motor and had everything except the heads available. It seems that the engine was originally built many years ago to power a racing hydroplane boat (for which the 215 engine was a popular mill). The engine was apparently built, run on a test stand or a dyno only once for a short period of time, never installed into the hydroplane, and stored. Eventually the boat and engine's owner passed away and the combination was purchased by a fellow in Arizona. The new owner had no plans to use the aluminum V8 and contacted Dan. When the motor eventually made it to the D&D shop in Michigan, it was pretty much an unknown entity. 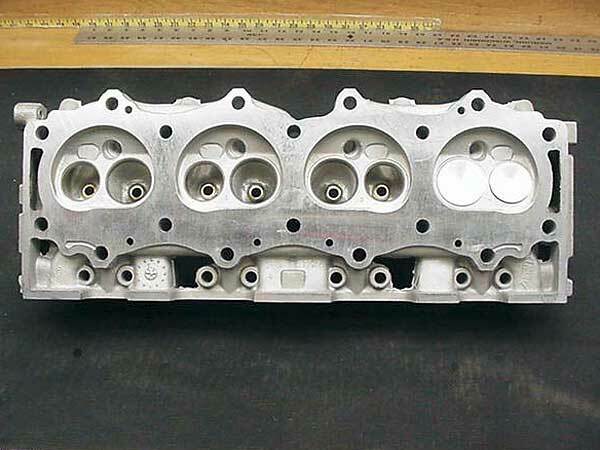 The heads were found to have been extensively ported and were soon shipped off to one of Dan's customer's, leaving the balance of the engine on the engine stand. When the heads and oil pans were removed, the long block turned out to be a treasure trove of mid-sixties Mickey Thompson speed parts. A 3-3/4" welded crank (yielding 289 cubic inches), boxed connecting rods, M/T pistons, roller cam and roller lifters, reinforced cam gears, and a block machined for the crank and rod clearances. The main bearing caps are reinforced with massive steel supports about an inch thick. The pistons show just a hint of heat tint, evidence of only a few minutes running time. Over the next few months, I will be going over each component of the engine, measuring, cleaning and improving where feasible. For instance, the roller cam is an unknown. I will have to have it "mapped" by a cam expert to figure out the specs and whether it is suitable for street use. The progress of this project will be documented for the Newsletter (Actually, I have mixed emotions about even using all these neat vintage parts in a running motor, due to their rarity. They would look great on the fireplace mantle!). Being that the engine came to me with no heads, I decided this would be the first problem to be addressed. The Buick/Olds 215, as well as the Rover, V8's, are well known to be head restricted. That means the port size/configuration and the rather smallish valve diameters will not allow sufficient fuel/air flow to make real power. Even mild porting, while entirely worthwhile, will not allow the engine to breath enough to reach full potential. I could have used modified later Rover heads, but this would have created problems with the valve train and with compression. 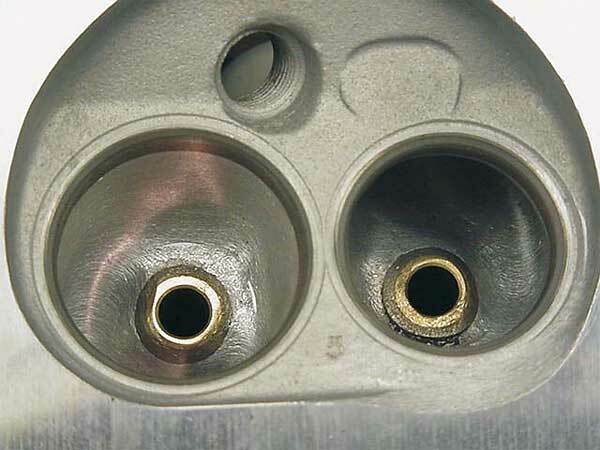 The pistons/compression ratio were set up for the 51cc (casting suffix -746) low-compression Olds heads. 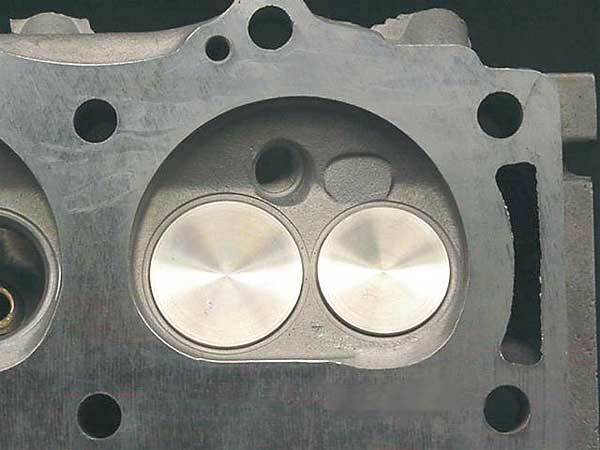 Using Buick/Rover heads with their 37cc chambers, would have resulted in a compression ration in excess of 11.5:1. So, the heads would have to remain Olds 215, but would require extensive reworking in order to support 289" cid. One favorable factor is that the long stroke will dictate a rather low maximum RPM, somewhat lessening the flow requirements for the heads. Participants of the past MG V8 Conventions know Dale Spooner. Dale has been a V8'er for many years and one of the first builders to have put together a well handling Ford 302 small block MGB. In addition, Dale is the proprietor of one of New England's premier engine machine shops, Motion Machine in South Burlington, VT. Motion Machine specializes in the precision machining required for successful high performance and exotic engine building. Many other machine shops routinely send their difficult work over to Dale, such as four valve/cylinder heads, Ferrari and other exotics, as well as rectification of other's bungled jobs. For high performance head work, Dale works closely with Dwayne Porter, a master porting and high performance head expert. Dwayne has his flow bench and porting equipment in the Motion Machine facilities. 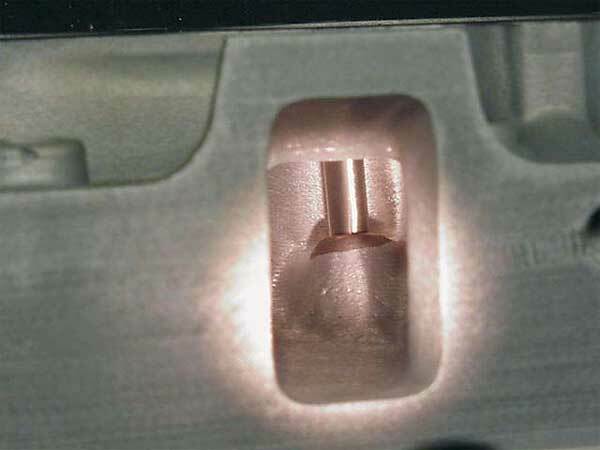 Dwayne performed a baseline flow-bench test of the stock Olds head with stock valves. He then proceeded to develop the optimal port shape and size, performing three additional flow bench tests at various stages of the development. • Test 1 - Stock Oldsmobile 8.75:1 aluminum head with stock 1.525" diameter intake valves and 1.350" diameter exhaust valves. • Test 2 - Basic full port job, intake opened to 1.70" x 1.00", stock valves, 30 back cut on the valves, competition valve job. • Test 3 - Basic full port job, intake opened to 1.70" x 1.00", 1.620" diameter intake valve, 1.400" diameter exhaust valve, both valves with 30 back cut, re-blended bowls. • Test 4 - Basic full port job, intake opening to 1.80" x 1.00", 1.620" diameter intake valve, 1.400" diameter exhaust valve, both valves with 30 back cut, re-blended bowls, fully polished runners, more guide streamlining. The final results showed an approximate 32 percent increase in intake flow and a whopping 54 percent in the exhaust flow (both at 0.600" lift).